Dunno, I think he missed a dose. Let it be said here, and clear for the record, I have NEVER had the Dose. Ladies? You may now return to your regular scheduled positions. I just see the person. Oh yes the once lethal Spam Hammer was spammed. Is there no sanctity? Have these spammers crossed the line? I think they have. Time for Son of Spam Hammer to spring forth and bring pestilence and devastation to these evil cyber vermin. Well that's my biblical moment for 2014 and I'm done. Now to take my meds and go back to my little room. Yup. 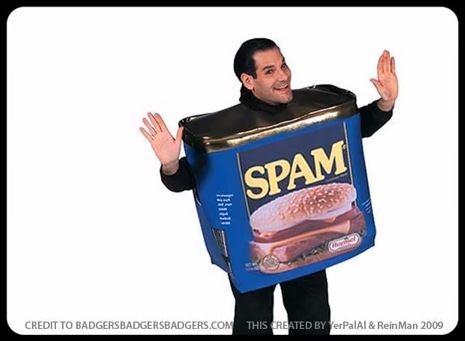 I'm hammering my SPAM in Ontario, Canadah Land now. Have been for over two years.